Dedicated to classics and hits. @ The Glass House in Pomona, CA. @ The Getty Museum Los Angeles, CA. @ The Echoplex in Los Angeles, CA. I very much had baseball on my mind this weekend. Watching the Oakland A's earlier this month had me thinking about "Moneyball" as a concept- the idea that you can find under-valued baseball players to make a small market team a contender against more wealthy clubs. Naturally, I started considering the way "Moneyball" concepts might over-lap with the music business. Last night though, I watched Ryan Vogelsong win an important game for the San Francisco Giants in the Major League Baseball playoffs, and his story- 10 minor league teams and 2 Japanese teams before achieving his current success in Major League baseball- seemed to drive home another, non-Moneyball related lesson about dedication to achieving success in a specific field. Although Moneyball is about more then statistics (it's about economics AND statistics), statistics play an important starting point for any Moneyball style analysis. For a rock band, those statistics are show attendance for a specific market + Soundscan registered album sales in the same market. If you add those two numbers together you get a number. Even if you don't know the exact statistics for a specific Artist you can look at the size of the venue they play and the total number of albums sold for a specific release and get a solid idea about whether a specific Artist is a Major league, Minor league or Amateur. If a band can't even generate a score in 20 of the top 50 markets in the United States, they are in the category of Amateur- because Sound Scan is a relied upon indicator of album sales- albums sold outside this framework count for nothing. To apply "Moneyball" principles to these statistics would be to look for Artists who score low on the market ticket sales + sound scan album sales metric. Obviously, bands that sell a million Album through non-Sound Scan channels are at the top of the list. For Artists themselves, understanding commonly relied upon music industry measures of value is a significant step towards professionalism. Bands can pursue the goals of touring and album releasing without outside support- and if a specific act can't do that, then they aren't serious about becoming professional musicians. One key feature that pops up when you look at bands as baseball players is the value of endurance. 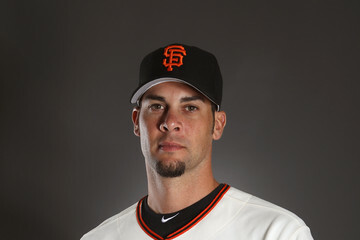 (See Ryan Vogelsong's pre-San Francisco Giants resume.) It's important to be able to maintain the statistical "heartbeat" of measureable album sales and event attendance figures within the last 24 months. Crocodiles, The Soft Pack and Cold Cave all fit within the same "league" of American indie rock bands. Stylistically they occupy a spectrum from "syth rock" to "fuzz rock" but all three are bands that are fully within the Major/Minor league group of rock bands. The Glass House in Pomona, CA. The Friday night concert for The Soft Pack, Crocodiles & Heavy Hawaii was at the Glasshouse in Pomona, CA. Pomona, CA is Golden Voice/AEG territory- I was told that Paul Tollett is the actual owner of the Fox Theatre down the street from Glass House- I assume it has a capacity of 500-1000. Pomona, CA. 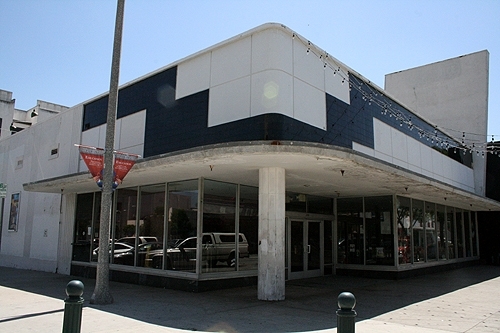 is geographically located at the western edge of San Bernardino County and is hardly the most glamorous of locations. The major east-west train line literally runs through the center of the town, Bakersfield, CA. style. You can actually sit in the park across from and trainspot. If you close your eyes it's easy to imagine the scene circa 1920 with hobos staring out of box cars in the dusky twilight, as a train rumbles by. The Glass House has an 800 capacity, and I saw it full for the pre-Coachella Jesus & Mary Chain a few years back. Tonight was a more intimate affair, and during the show I was wondering why the Inland Empire doesn't have an Echo/Casbah size 21+ option- it seems like there are plenty of vacant buildings available to either renovate or build a more intimate 200-300 capacity venue that could take over flow from the other major Southern California markets. You could put something over in Ontario that would be right in the center of a 4 million size market and would have, literally, zero competition- all you need is the booking contacts of the Echo in LA or the Casbah in San Diego. 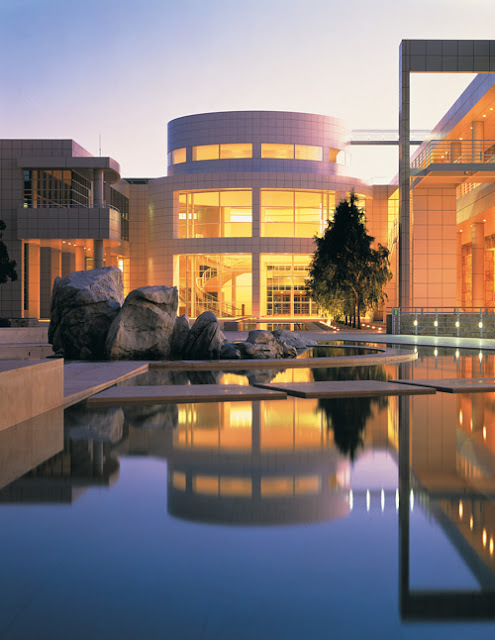 The Getty Center Los Angeles, CA. Regardless, it was pretty incredible to watch Mario DJ for the Audience- which was eager to see Cold Cave. I believe more then 1500 people showed up. Cold Cave fans predominated- my speculation that the crowd might contain many people who were just there for the Museum and vibe proved largely unfounded. Saturday night was Friday night's bill repeated at the Echoplex. 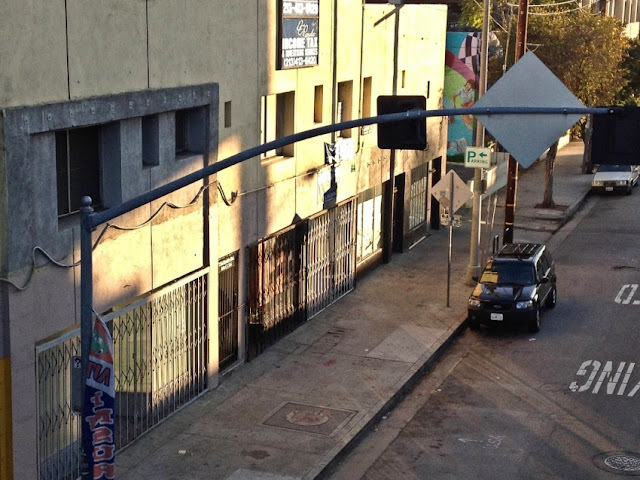 This was my first trip to the Echoplex, which is located underneath the Echo, but with an entrance that is on a street that runs underneath and perpendicular to Sunset Ave. The entrance is to the left in the parking lot with the mural on the fall wall. I would rather see a band at the half full Echoplex then a bonkers Echo show- I can't even imagine what a sold out Echoplex show must involve. All the bands seemed happy to be home, they all seemed reasonably fresh considering the amount of time spent on the road. Heavy Hawaii in particular seemed to have grown in confidence and had a more convincing delivery then before they left San Diego. I think the over-riding concern confronting both Crocodiles & The Soft Pack is persistence. Are they willing to stick it out for 10 years or more for the chance that they reach some kind of critical mass equivalent to that of the "Major League" rock bands of today, or can they find a different or smaller niche within the music industry or do they give up. Certainly both band require growth in Audience size to sustain something resemble a sustainable, middle class life-style. Both bands face the relentless pressure that time places on mid-level indie musicians- opportunities foregone and the sheer grind of playing to small crowds in minor markets. Unfortunately, there is no better way to increase Audience size for a rock band. The existing Audience for rock music is older and less plugged in the disciples of edm and hip hop. In that way, a contemporary indie rock band is more like a country artist then a hip hop artist. Like country artists, rock bands are looking for an Audience that exists "off-line" and an "on-line" Audience that is skeptical of the value of the art form itself. If an individual Artist is doing that it's just a question of when success will occur and if they are ready to wait it out and continue to produce music and tour. Like Ryan Vogelsong playing for 12 years in the Minor Leagues. He was willing to persist where many would have quit.